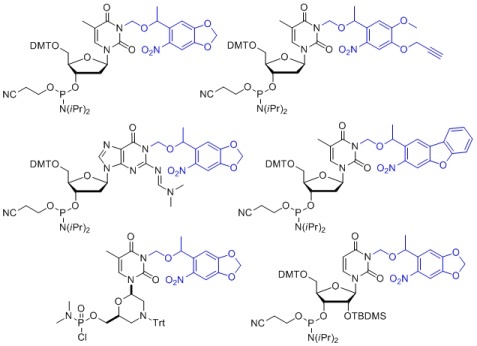 Our approach to the optochemical regulation of oligonucleotide function involves the synthesis of nucleotides containing light-removable protecting groups, so called caging groups. We have assembled a broad range of these building blocks through multi-step synthetic routes. The caged phosphoramidites are incorporated into DNA and RNA through automated oligonucleotide polymerization chemistry on solid-support. We have demonstrated that we can target all four different bases and that we can apply this approach to the optochemical regulation of antisense agents, DNA decoys, DNA logic gates, and triplex-forming oligonucleotides in mammalian cells and aquatic embryos.